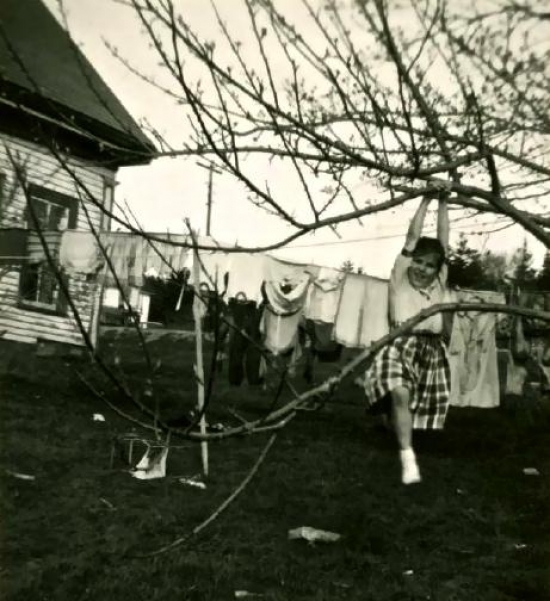 Jean Ranquist monkeying around on a Swan’s Island tree, laundry line in the background (1958-1959). Courtesy of the Gwen May Collection, Swan’s Island Historical Society. Time to talk about Swan’s Island’s dirty laundry! This isn’t knitting group gossip; I mean that literally. As a member of a generation with notoriously poor housekeeping skills (or is it just me? ), I’m pretty proud when I get my laundry attached to the line securely enough to keep the sea breeze from lifting it next door. You can imagine my surprise when I learned that, at least on Swan’s Island, there is a Right Way and a Wrong Way to hang laundry. This extends past my only rule, “Try to keep your underpants where they can’t be seen from the road” (a good rule of thumb for both laundry and life in general). Donna Donley, who grew up on the island, talked about the time her sister Jean Ranquist visited her first home. Candis Joyce’s family felt the same way. Her mother even put wet clothes in the hamper in order, so that they’d automatically be in the right position to hang on the line. Families had their own way to hang things, and thought other women were imbeciles when they got it wrong. Candis also pointed out that you could tell a lot about a family’s personal life by what they had up on their line. Going back, the laundry was done by hand—scrubbed and then cranked through wringers that left scars on many a curious child’s hand. Donna remembered her neighbor Marguerite Orcutt washing cloth diapers on the porch. For a while, Dorothy Stockbridge had three kids in diapers at once. She laughed when she told me about a neighbor walking over the hill and seeing the lines strung everywhere. There were lots of tricks to the trade. You could tell by the smell and feel of the wind if it was a good drying day. Hanging overnight would keep the sun from bleaching colors. Some even said drying on a foggy day would get rid of mustard stains. Bonnie Holmes’ mother hung her laundry outside in the winter, let it freeze solid, and brought it in at the end of the day to dry on a rack over the furnace. The work wasn’t done after drying. One of Bonnie’s chores was to do the family ironing. She thought some of her work was a little excessive. Now that I’ve done my research, I feel I ought to reform my ways. If nothing else it will do justice to the clotheslines I use at the former home of Lenora Wheaton, who was by all accounts a meticulous housekeeper. Guess it’s back to the ironing board. Kaitlin Webber is an Island Fellow through AmeriCorps and the Island Institute working with the Swan’s Island Historical Society.